Microstructures of two different foam materials: (left) a traditional open-cell stochastic foam; (right) a 3D printed foam with a face-centered tetragonal lattice structure. 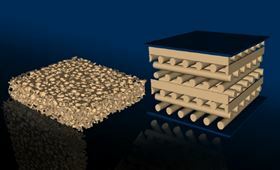 Material scientists at Lawrence Livermore National Laboratory (LLNL) have found that three-dimensional (3D) printed foam works better than standard cellular materials in terms of durability and long-term mechanical performance. Foams, also known as cellular solids, are an important class of materials with applications ranging from thermal insulation to shock absorbing support cushions to lightweight structural components. As such, they find use in a large number of industries, including automotive, aerospace, electronics, marine, biomedical, packaging and defense. Traditionally, foams are created by processes that lead to a highly non-uniform structure with significant variation in the size, shape, thickness, connectedness and topology of the constituent cells. Recently, scientists at the additive manufacturing lab at LLNL demonstrated the feasibility of using a 3D printing process called direct-ink-write to produce much more uniform foam structures (see image). However, since 3D printing requires the use of polymers with certain properties, it is important to understand the long-term mechanical stability of such printed materials before they can be commercialized. This is especially vital in applications such as support cushions where the foam material is subjected to long-term mechanical stresses. To address the stability question, the LLNL team performed accelerated aging experiments in which samples of both traditional foam and 3D printed materials were subjected to a set of elevated temperatures under constant compressive strain. The stress condition, mechanical response and permanent structural deformation of each sample were monitored for a period of one year, and in some cases even longer. A method called time-temperature-superposition was then used to quantitatively model the evolution of such properties over a period of decades under ambient conditions. This study convincingly demonstrated that 3D printed materials generally age more slowly, in terms of retaining their mechanical and structural characteristics, compared with their traditional counterparts. Interestingly, however, foams made with native rubber showed exactly the opposite effect, with the rubber in the printed material aging faster than the corresponding rubber used in the traditional foam. To gain further insight into why the printed cellular material usually displayed superior long-term stability, the team imaged the 3D micro-structure of each foam sample with X-ray computed tomography, and performed finite-element analysis of the stress distribution within each micro-structure. They found a much wider variation in local stresses within the traditional foam, including maximum stress points that were significantly higher than in the more uniform 3D printed foam. This research is described in a paper in Scientific Reports. "3D printing of foams offers tremendous flexibility in creating programmable architectures, customizable shapes and tunable mechanical response," said lead author Amitesh Maiti. "Now that our work strongly indicates superior long-term stability and performance of the printed material, there is no reason not to consider replacing traditional foam with appropriately designed 3D printed foam in specific future applications." This story is adapted from material from Lawrence Livermore National Laboratory, with editorial changes made by Materials Today. The views expressed in this article do not necessarily represent those of Elsevier. Link to original source. Materials company BASF plans to establish a new group company, BASF 3D Printing Solutions GmbH, from September 2017.